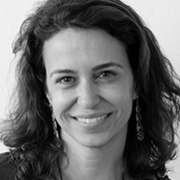 Luciane obtained an undergraduate degree in Computer Science and an MBA in Marketing from Pontifícia Universidade Católica do Rio de Janeiro, and has specialised in Strategic Design at IED-Rio. She has extensive experience in the field of marketing, having held leadership positions in companies such as Embratel, Claro, Shell and IBM. In 2008, Luciane founded the agency MashUp, which develops live and experimental marketing projects, with clients such as Claro, Mobil, Farm, Opera and Tam Airlines.